In the wake of Barack Obama’s re-election, a bipartisan “grand bargain” to reduce the federal budget deficit is on the agenda. It’s inevitable that “raising the retirement age” for Social Security benefits will be talked about by corporate media as an option that would save the government large amounts of money. Such talk, however, will be entirely misleading—and designed to mislead. Gradually raising the retirement age (currently 66 and climbing slowly to 67) for able-bodied workers is the approach that best matches the reason the program is in trouble. Social Security is not bloated or poorly run. Its shortfall is primarily the result of people living longer, and therefore drawing benefits longer. And when Romney picked Paul Ryan as his partner on the GOP ticket, the Washington Post (8/12/12) voiced its approval of Ryan’s “willingness to tackle third-rail issues,” including “raising the retirement age” for Social Security. When Reagan and O’Neill “tweaked” Social Security in 1983, they didn’t actually “raise the retirement age”; you could retire at age 62 before, and when their plan is fully phased in in 2022 (barring further “tweaks”), you will still be able to retire at age 62. The way Social Security benefits work is that the longer you delay getting them, the more you get per month. The Reagan/ O’Neill scheme cuts the benefit that you got at any particular age, so that people who retire at 64 get as much as people who retire at 62 used to get, people who retire at 65 get as much as 63-year-olds used to, and so on. You still reach the maximum retirement benefit by retiring at age 70—but that maximum benefit is smaller than it would have been if you had been born a generation earlier. 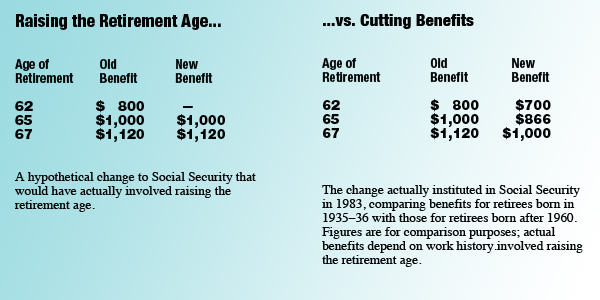 This is what they called “raising the retirement age.” There’s a simpler, more understandable and more accurate way to describe it: “cutting Social Security benefits.” You take the amount of money everyone’s going to get, and you reduce it; that’s what “cutting” means. It’s likely that a big part of the reason it sounds better to people is that the “retirement age” framing actually makes them misunderstand what’s being proposed. You imagine not getting a couple of years of benefits while you continue to work—you don’t imagine a slice taken out of every check you get for the rest of your life. Because, really—what is it about living longer that should make people need less money for their retirement? This work is licensed by Fair.org under a Creative Commons Attribution-NonCommercial-NoDerivs 3.0 Unported License. The most misleading part of the argument is the false claim that Social Security adding to the national debt. SS has it's own funding mechanism, is not part of the general budget and currently has $2.7 trillion is it's trust fund. This is why solutions to fix SS should not be mentioned in the same breath as balancing the budget. Sorry to say Fox News and corporate media has totally confused many in the general public to the point that they believe nothing I say makes any sense.